Happy Friday! How awesome to have a three day weekend after being off for two days due to flooding from Hurricane Issac?! Yep, it’s pretty fantastic. I have plans to go to the beach one day since I didn’t go much this summer. I’ve survived two weeks back at work and I can tell you that this year seems like it will be much better in terms of the students. The adults aren’t worth any additional mentions in my blogposts so I’ll strive diligently to refrain from sharing those memorable working with adult moments. Like most of you I’m a peplum fan. My first peplum was this thrifted dress posted here. Since that day I’ve picked up tops at various locations. This one was $13 at Marshalls. Initially, I felt the collar made it seem youthful but after seeing this post by Leslie that notion was tossed from my style file. Did you notice I forgot to wear earrings? I didn’t realize it until I arrived at work and a co-worker asked me where my earrings where. Booo L All school year I kept studs in my purse but took them out this summer. Guess what will be going back into my wallet? I don’t talk about my hair much here but the braided updo came down after I took these photos. If you follow me on Instagram I posted two pictures. I can’t believe how much my hair has grown in 9 months. I’m excited. Downside for me is that I have very very very VERY thick hair and I’m tender headed. The plan is to give the hair a rest for a week and then have it styled again. Here’s to an outstanding Memorial Day weekend. I’d also like to send a special thanks to the many many bloggers who are a part of the Bloggers Like Me (BLM) Facebook group. I appreciate your visiting, RTing my posts, commenting and support and love. 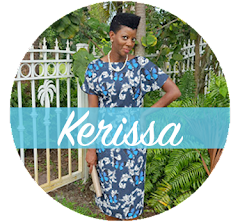 Who knew there were so many beautiful sisters blogging like me. I’m glad I’m a part of the BLM world. IS ANYONE ELSE IN LOVE WITH THIS SONG? You look adorable!! That top though!! Love it!! Love that top and I am obsessed with that Miguel song!!! ok so i am SOOO obsessed with the miguel song as well! LOVE IT! you look wonderful and i love your top! Nice find on the peplum. The entire outfit cam together beautifully. You look marvelous! Love the entire outfit!!! I didn't notice you weren't wearing earrings but I too carry some in my purse because if I forget I feel naked! So I understand the feeling! Roni, I play out ask day everyday & I, ain't even booed up, lolol! Welcome to the Adorn Club Nic! Thanks darling. I need to raid your shoe closet YoYo!! 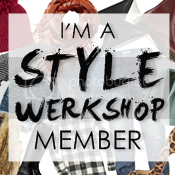 Do you own a boutique? Thanks for stopping by. I felt fab in this fit. Girly but appropriate for work. Sorry beautiful about the TMI. I figured you all would notice. I have a pair of studs in the handbag now though. XoXo. I didn't notice you forgot your earrings, this outfit is so cute I really need that top, really I need everything. Ok I'm going on a diet so you can send me this look. P.S. I HATE when I forget my earrings too! That Peter pan is everything! But I can understand what you mean about it possibly being youthful. Another great outfit my dear. I have also become tender headed since becoming natural, boooooo!